Apteryx was the first high altitude balloon that the three of us -- Greg Klein, Alex Martin, and Tim Wheeler -- launched in the summer of 2009. It was designed to be as simple as possible: basically, we wanted to get our foot in the door. The balloon carried a very simple 4 pound payload -- it contained a camera, radio, and a few sensors. The balloon traveled to an altitude of roughly 90,000 ft over a period of about 5 hours. We were able to recover the payload, so we consider this mission to be a success. We did have a few problems with the tracking and weather prediction, and these issues definitely need to be solved before we launch anything else. Total cost for the project was $800. Telemetry served only one purpose for us -- we needed to know where the balloon was (more specifically, where it landed). For tracking, we used a Byonics Micro-Trak AIO APRS radio. The AIO is an one-way radio; it periodically transmits GPS coordinates every two minutes. When it got to above 60,000 ft, the GPS stopped working until it dropped back below 60,000 ft. It came with a rubber-duck antenna which we replaced with a J-Pole tied to the load line. None of us had a cellular plan with internet access, so we needed to find some way to relay the APRS coordinates back to us. We had two implementations of this. 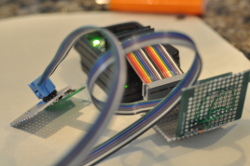 Alex was able to rig up a Debian desktop computer running soundmodem to decode the packets coming through on his radio. Unfortunately, we weren't able to power the computer for more than 15 minutes -- we thought that the UPS would last longer than it actually did. Greg wrote a Perl script using the Ham::APRS::LastPacket CPAN module that would a text message to one of us every 10 minutes with the latest GPS coordinates, time, and altitute. For whatever reason, it wasn't reporting accurate, recent coordinates the day of the launch --. it kept reporting that we were still in Cupertino. Ultimately, we had to periodically call somone with an internet connection and ask for coordinates. Also in the payload was room for a "science payload." This portion of the payload was the very last constructed -- it was actually not on the original plans, but we quicky determined that we were very underweight and could add more room. 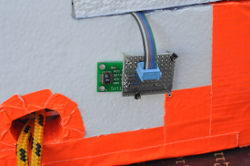 The basic premise of the science payload was to collect sensor data about the environment -- essentially to figure out what the conditions are like at the altitudes through which the balloon traveled. We decided to measure humidity, barometric pressure, temperature, and acceleration. The controller and storage was a SunSPOT. The SunSPOT has 4 MB of flash memory to which we were able to record our environmental data. We settled on using an SHT15 to measure humidity and temperature and an SCP1000 to measure barometric pressure, as well as the accelerometer and temperature sensor built onto the SunSPOT itself. The SHT15 was mounted on the outside of the payload, whereas the SunSPOT and SCP1000 were inside of the science payload, surrounded by styrofoam. 673 samples of 5 sensors each were taken overall. The science payload cut out about 20 minutes before landing, just after the balloon burst; we believe this was because we ran out of space on the SunSPOT. The source code that ran on the ballon has been released under the BSD license. The camera inside of the payload. In the payload was a Canon A470 camera running CHDK with a 16 GB SDHC card. The Canon was programmed to take a picture every 6 seconds throughout all stages of the flight. A small hole was cut in the styrofoam payload for the lens to stick through. We had heard that batteries, especially alkaline batteries, do poorly at low temperatures. Everything we had read seemed to state that the temperature we'd experience could be about -40 °C. So rather than use Alkaline batteries, we used Lithium AA batteries -- they were more expensive, but lasted much longer and survived the entire flight. Overall, 2927 pictures -- about 7.2 gigabytes worth -- were taken during the flight. We found image quality was acceptable, especially considering the price ($99 on sale) of this camera. If we are to do this again, we may want to use a more high-quality camera with a larger sensor, perhaps shooting in IR to pierce the atmospheric haze. The balloon we used was a Kaymont 1500 gram sounding balloon. With a 4 pound payload, the balloon was actually probably too large for our needs; in the future we will be able to purchase a smaller (and cheaper) balloon. The balloon was tied off by wrapping the nozzle in duct tape and zip ties, and was taped to our load line. The load line was made of thin twine, which attached to a carabiner tied to the payload. Between the balloon and the payload were a radar reflector from West Marine and a 5 ft parachute from Rocketman Enterprises. 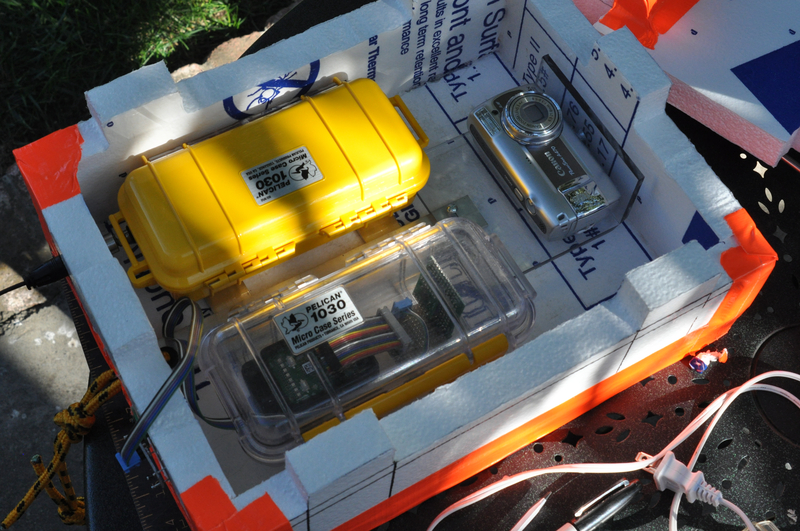 The payload itself consisted of two Pelican cases riveted to a bar of aluminum. 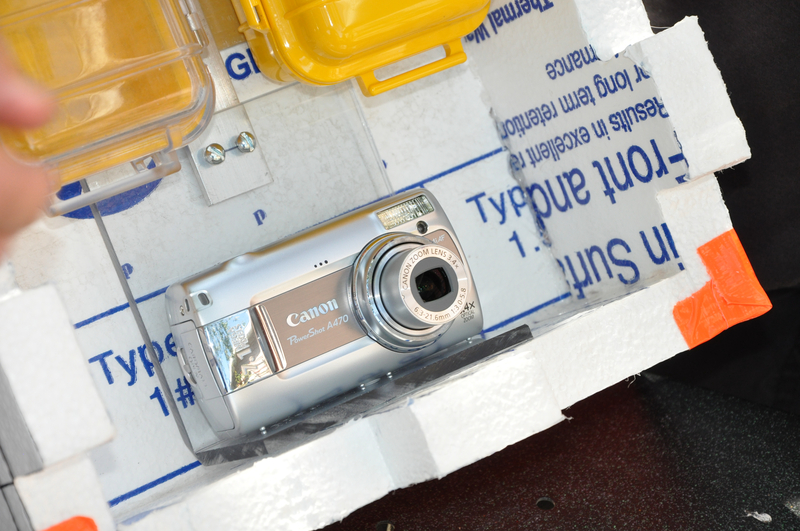 The camera was attached via a bent piece of plexiglass also riveted to the aluminum bar. The plexiglass protected the back of the camera from stray presses on the buttons whenever the payload got bumped. The entire assembly was surrounded by a styrofoam box for padding and insulation. The balloon was launched on September 9th, 2009 from Tres Pinos, CA. We made two huge mistakes on the day of: we underfilled the balloon and misjudged the winds. As this was the first time any of us had filled such a balloon, none of us knew how much helium to put in it. All of the literature I'd read indicated that a reasonable flight time for such a project would be about 3 hours: two hours ascending and one hour descending. We hit about 5 hours; 4 and a half ascending and half an hour descending. Even though we designed the experiments to only last 3 hours, the camera functioned for the entirety of the flight, and the science payload came close. 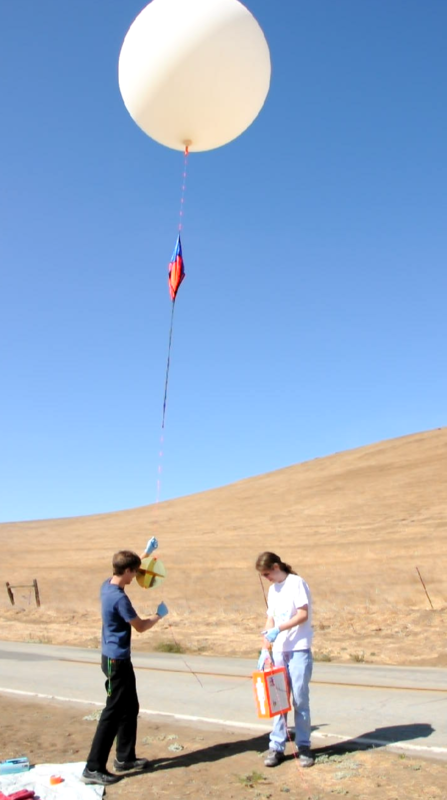 We had planned on recovering the balloon in the Central Valley, to the East of our launch site. The land is flat in the Valley, so it would have been quite easy to recover. The wind, however, pushed the balloon North of our lanch site, and the balloon landed in Henry Coe State Park -- a very difficult place to find a balloon. We had intended on recovering the balloon on the same day as the launch, but we had very poor GPS data of the landing location -- the last coordinate we got indicated the payload was 3,000 ft. above the ground. Fortunately, on Saturday, an APRS digipeter picked up a few readings from our payload: we knew exactly were to look. The payload was recovered on Sunday. We're not entirely sure how high the balloon actually went. The GPS cut out at 60,000 ft, so we can't rely on that. The lowest barometric pressure sample we recorded with our science payload was 1.86 kPa -- this correlates to about 90,000 ft. The datasheet for the pressure sensor, however, indicates that the readings are only accurate above 30 kPa. Looking at the information prior to the 60,000 ft GPS blackout, it appears as though the balloon was rising at a rate of 450 feet/minute. Extrapolating from the 4 hour 30 minute time from launch to burst, we get something around 120,000 feet. We retrieved over 600 sensor readings of external temperature, internal temperature, pressure, humidity, and acceleration. These results are hosted on sensor.network.com. If you want, you can grab a CSV file of our sensor readings here. Alex stitched together a bunch of pictures from the apex of the flight to form a high-res panorama. It's quite nice; definitely worth taking a look. Apparently it took 8 hours to stich on an 8 core Mac Pro. We have several thousand pictures -- if you're interested, they can all be found here. Be warned, there are a lot of them, and after you see a few, you'll likely get bored. I've gone through the pictures and here are a few of the best. Click on any one of them to get a larger version. Right before Alex cut the line. Looking at Pacheco Pass and the San Luis Reservoir. Look closely and you can see an airplane. A nice view of all of Moneterey Bay. We've had a lot of people help us out with this project, and we'd like to thank a few of them. Arshan Poursohi of Sun Labs, for lending Greg sensors and the equipment required to fill the balloon. Larry Klein, Jim Bodwin, and Jim Wheeler, for spending the better part of a Sunday on bikes helping us find our payload. Alejandro Schuler, Sam Sharps, and Yusuf Jabri, for helping us search on foot. Robert Martin and Larry Klein for passing us GPS data when our systems failed. Much of the project was inspired from other's projects: particularly, Alexei Karpenko's HALO Flight 2 and jmeehan's Flight 1.0. L. Paul Verhage's near space book was also a quite useful. If you're interested, you can also view the Twitter feed for launch day. This page was also on Reddit for a bit; here's the article.